This CTS Knowledge Base article summarizes the manner in which ash affects the performance of the engine and particulate filter. Proper filter maintenance and ash cleaning is important to ensure efficient engine operation and extend the life of the diesel particulate filter (DPF). Ash accumulation directly restricts exhaust flow through the DPF, increasing back pressure and making it harder for the engine to breathe. The increase in back pressure is commonly measured as an increase in pressure differential, or pressure drop, across the DPF. This increase in pressure drop negatively impacts fuel economy. In addition, the ash occupies some of the filter volume, reducing the filtration area available for soot, which results in more frequent regenerations and additional fuel consumed, as well as thermal aging of the DPF. Figure 1 presents the effects of ash build-up in the DPF on engine fuel consumption [1-2]. Figure 1: Impact of ash on fuel consumption, showing contributions of back pressure and regeneration frequency. The increase in engine fuel consumption due to the DPF can be broken down into two components, as shown in Figure 1. The first component is the increase in exhaust backpressure due to the added flow restriction of the filter. Ash build-up in the filter increases flow restriction and shifts this curve up further. The second component is the regeneration interval, or the frequency with which active regenerations occur. Frequent active regenerations result in a larger fuel penalty due to the additional fuel required to periodically heat the filter. Extending the regeneration interval (longer time between regenerations) reduces the regeneration-related fuel consumption, but results in a greater back pressure-related fuel penalty as more soot builds up in the DPF before it can be burned off. Ash accumulation in the DPF also effectively reduces the filter volume available for soot. In other words, it reduces the filter’s soot storage capacity. Reducing the soot storage capacity also results in the need for more frequent regenerations, thereby moving up and to the left on the regeneration fuel consumption curve shown in Figure 1 . For filters with a large quantity of ash accumulated in the end-plugs, the soot distribution is also affected and concentrated to the front of the filter. This non-uniform soot distribution can result in large temperature gradients and higher thermal stresses across the DPF during regeneration. Ash build-up is the primary reason for premature DPF failure and is the most important factor controlling the service life of the filter. Proper maintenance and regular ash cleaning can help to extend the life of the DPF. Ash affects DPF performance in a number of ways, including filter flow restriction, filtration efficiency, and catalyst performance, in the case of catalyzed filters. 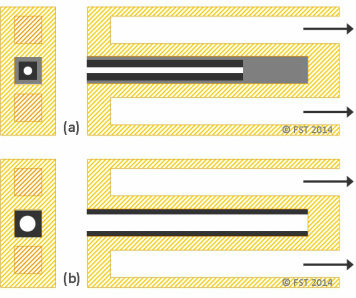 Figure 2: Ash and soot build-up in Diesel Particulate Filter (DPF) channels (a) and soot accumulation in Diesel Particulate Filter (DPF) channel with no ash (b). Figure 2 compares the effect of ash and soot accumulation in a DPF (a) to the ideal case with only soot accumulation in the DPF and no ash (b). Relative to the ideal case with no ash, the build-up of ash in a layer along the wall and in a plug at the back of the DPF results in a thicker layer of soot towards the front of the DPF. The effective channel diameter and available channel length is also reduced in (a) relative to (b). 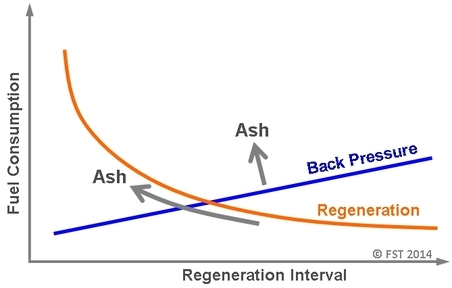 The obvious impact of the ash accumulation is the restriction of flow through the channel and increase in back pressure. Not apparent from Figure 2 is the more complex interaction of ash and soot, and the resulting effect on DPF pressure drop, which is beyond the scope of this article . Aside from impeding exhaust flow, the ash can also negatively affect the performance of the catalysts to oxidize the soot in a catalyzed DPF, through a number of mechanisms. In the case of the ash layer, the ash physically separates the soot from the filter wall where the catalyst is located. This reduces and in many cases eliminates contact between the soot and the catalyst, which can decrease the catalyst effectiveness. In addition, the ash plugged region at the back of the filter essentially blocks flow through this region of the filter, rendering the catalyst covered by the ash plug ineffective. A secondary effect is an increase in channel flow velocity and a decrease in residence time for the gas species to react over the catalyst. Lastly, the ash can also poison the catalyst, in some cases, depending on the specific chemical composition of the ash. From a filtration efficiency perspective, the accumulation of the ash in a layer along the channel wall actually serves to increase the filter’s particle trapping efficiency. This added ash layer, effectively forms a thin membrane across the filter surface, capturing and filtering out many of the smaller soot particles, which may otherwise escape the DPF . Typically, this improved filtration efficiency comes at the cost of increased back pressure. Ash build-up leads to increased fuel consumption by increasing exhaust back pressure and decreasing the filter’s soot storage capacity resulting in more frequent regenerations. Periodic ash cleaning and good engine maintenance practices not only help to reduce engine fuel consumption, but are also important to prolong the life and ensure peak performance of the particulate filter. Sappok, A. and Wong, V., “Ash Effects on Diesel Particulate Filter Pressure Drop Sensitivity to Soot and Implications for Regeneration Frequency and DPF Control,” SAE Int. J. Fuels Lubr. 3(1):380-396, 2010, doi:10.4271/2010-01-0811. Singh, N., Rutland, C., Foster, D., Narayanaswamy, K. et al., “Investigation into Different DPF Regeneration Strategies Based on Fuel Economy Using Integrated System Simulation,” SAE Technical Paper 2009-01-1275, 2009, doi:10.4271/2009-01-1275. Sappok, A., Santiago, M., Vianna, T., and Wong, V., “Characteristics and Effects of Ash Accumulation on Diesel Particulate Filter Performance: Rapidly Aged and Field Aged Results,” SAE Technical Paper 2009-01-1086, 2009, doi:10.4271/2009-01-1086. Viswanathan, S., Rakovec, N., and Foster, D., “Microscale Study of Ash Accumulation Process in DPF Walls Using the Diesel Exhaust Filtration Analysis (DEFA) System,” ASME ICEF2012-92104, 2012.